The best way to freeze strawberries is the simplest and easiest. And I learned it all from my Italian Aunt! 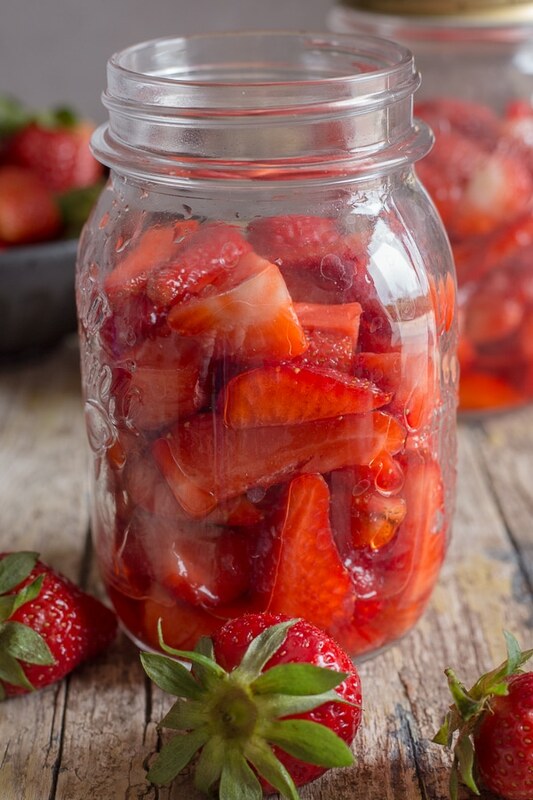 All you need are strawberries, a little lemon juice, some sugar and a couple of jars! A couple of weeks ago the Italian and I went to visit his Aunt and Uncle (the Uncle is actually my mother-in-law’s brother). They live in the province of Frosinone in the town of Sora. It’s a really nice drive of about 2 hours just south of us. I love going to visit because 1. I don’t have to cook and 2. I usually come home with a two or three recipes. Which of course happened. Our Aunt made a delicious pasta dish, one of my favourites I might add. Fettuccine and Mushrooms, to make it even more tastier, she add some chopped Italian sausage. So good. She also made Italian Fried Chicken and a tossed salad with fresh tomatoes, cucumbers and green onions, and of course tossed with some olive oil, wine vinegar and a sprinkle of salt. But then came dessert, never mind the Italian mini pastries that I picked up from one of our bakeries in town, but her Fruit Salad was to die for. I love fruit salad and it is one thing I do make quite often in the Summer with all the beautiful fresh fruit around. I am going to tell you that that fruit salad was one of the best I have ever eaten! Full of cut up peaches, apricots, kiwi, an apple or two and of course strawberries, (and a secret ingredient but I will let you know about that next time). But what made my ears perk up was when she mentioned to her husband that these were the strawberries from last year! What? They were sweet and juicy and, well perfect. I loved the idea of having a winter fruit salad with some Summer Strawberries that I froze. And just think of all the other things you can do with them! So I asked her if she froze her strawberries the usual way? and then freezing them before bagging them? Of course it wasn’t, she would not go to all that trouble! 🙂 And naturally she proceeded to tell me the best and only way to Freeze Strawberries. And of course she said, don’t use the ones that just come out on the market wait until they are riper and cheaper! Chop or slice (depending how you like it). and lemon juice and toss gently to combine. Spoon into clean jars (leave an inch from the top free). Close the jars tightly and freeze. Let the strawberries thaw before using. Now tell me they aren’t amazing! My husband and I used to visit them more often when we first got married but with the arrival of kids things change and visits come few and far between. We had a great time sitting outside and I loved seeing her vegetable garden. Listening to her tell me more ways to make this and that dish. And of course we always stay longer than we planned but that’s ok too! Naturally we make plans to visit again soon, but until that time enjoy some sweet delicious Strawberries. Wash the jars in hot soapy water, rinse well and dry. 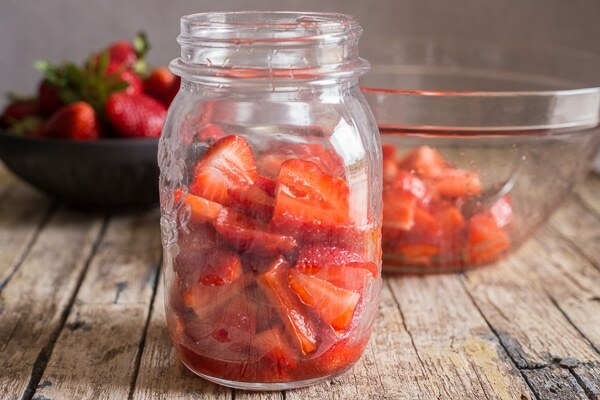 If the strawberries are already quite clean, then place them in a colander and rinse them under cold water, place them (single layer) on a dry clean tea towel and gently dry. Then hull and slice or chop depending on your preference. If the strawberries are not very clean (eg. just picked or it just rained and they have some dirt on them) then fill a large bowl with cool water, add the strawberries and move them around until they are clean. 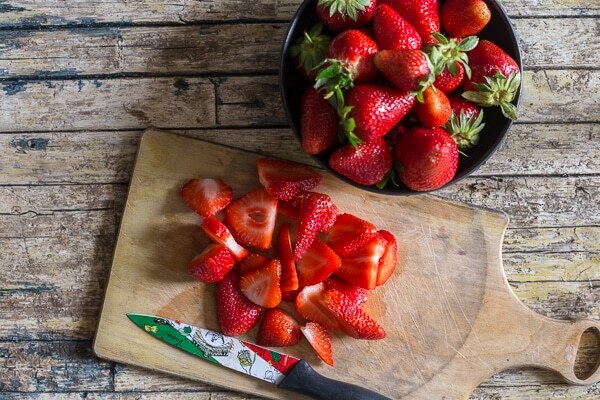 Remove the strawberries and place them (single layer) on a dry clean tea towel and gently dry. Then hull and slice or chop depending on your preference. 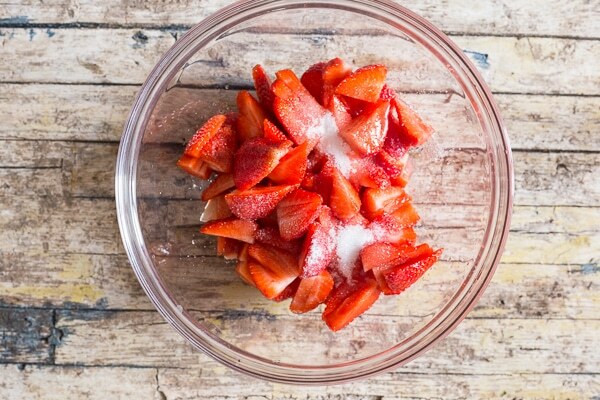 Place the sliced or chopped strawberries in a large bowl, sprinkle with lemon juice and sugar. Gently toss together. 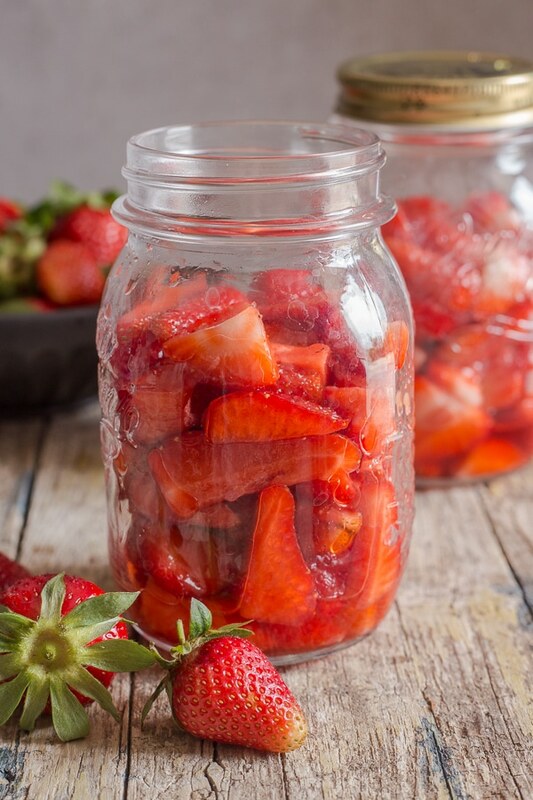 Spoon into the clean jars, leaving approximately one inch (2 centimeters) free space between the strawberries and the top. Then place jars in the freezer. Will keep up to a year. Enjoy! Thanks Beverly, I will redoing it this year also. Have a great weekend. 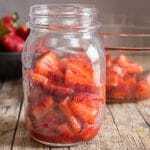 this is a great way to freeze strawberries, wished i read this post earlier! Hi Dannie, thanks, I hope you enjoy it. Do you think it will work in zipper bags? My freezer is not that big ans jars take up too many space…..
Hi ET yes I am sure it will work with zipper bags. Let me know how it goes. Hi! 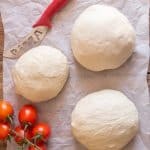 I just want to let you know that step 3 in your article says salt but your recipe says sugar. Hi Francisca, thanks so much, I corrected it. 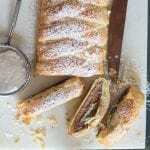 Hi Patricia , loving your recipes and really interested to give this a go – but can you clarify something for me please? 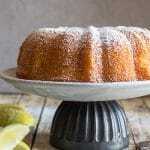 In the blog you say use salt and lemon juice and in the recipe you say sugar and lemon juice. I’m just wondering which is the right one. ( I know sugar seems the obvious- but the preservative quality of salt is well know so I’m a bit confused)! Thankyou. In your conversational part about how to freeze strawberries, you have to add lemon and salt. Below, in the official recipe it says sugar. I’m assuming it’s sugar, but I’d edit the wrong one. I would love to freeze strawberries for my husband – he loves them and I’m allergic to them. I forget to buy them for him when they are in season. Hi Kristin, yes my mistake should be sugar. Sorry about that it has been corrected. Thanks. I love your recipes. Thanks. 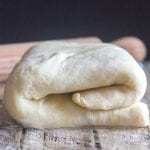 My brother in law family is from Pastena. Where are you located? Hi Patricia thanks so much, we are in a small town just outside of Rome.